Offering a lovely early 20th century armchair in an earlier style. It has been upholstered in natural Hessian Cloth. 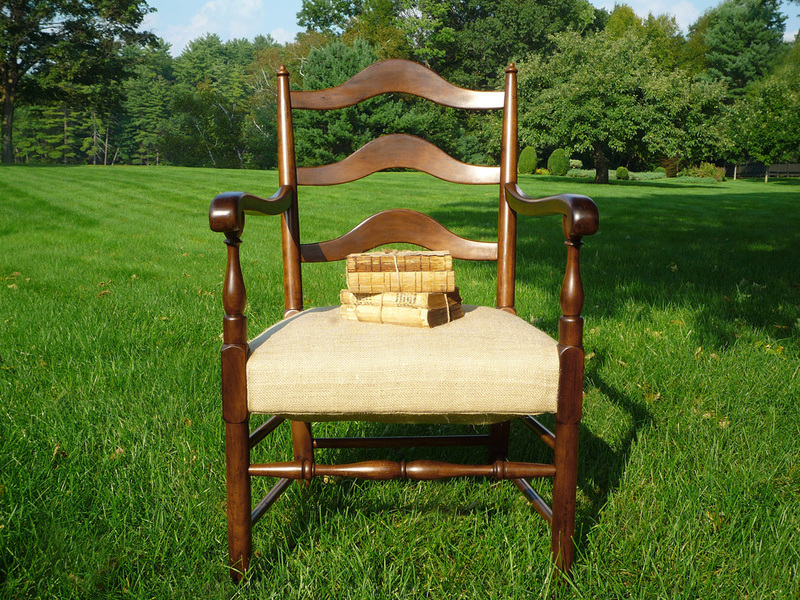 The chair frame is very solid and displays desirable age and wear to the wood. The finish is original, with a recent fine English wax coating added. There is a very small piece of missing wood on the bottom of the left front leg, which is to be expected of an antique chair. I’m not 100% which type of wood the chair was constructed from. It’s certainly very hard! The chair has very simple lines and a natural look, which make it versatile. It’s very wide and comfortable. The chair would go brilliantly next to the rustic 1840’s Empire Worktable, which I also have listed. This item is offered for local collection. It’s also offered for shipment by UPS or freight service. It can be delivered throughout New England and the New York City area. Please be in contact for shipping and handling charges, which will obviously vary by delivery method. The frame looks great, the polish is standing out with the contrast in the frame and the cushion. It would go well with both a contemporary or old setting, with dark or light walls. Very Nice!